Presenter view is like a control panel for a running PowerPoint presentation. With Presenter view running on a separate monitor, you can see any speaker notes for each slide, see what’s coming up next, jump around between slides, and more, all without disturbing what the audience sees. It’s possible to enter Presenter view on a single-monitor system, but there’s not much point in it, because it interrupts what the audience sees on that single monitor. From Slide Show view, right-click for the shortcut menu, and then click Show Presenter View. If the right-click shortcut menu has been disabled for security reasons, here’s an alternate method: Click the Options button in the slide show tools and then click Show Presenter View. Previous: This button displays the previous slide. Next: This button displays the next slide. Pen and Laser Pointer Tools: For the most part this is the same menu you see here. 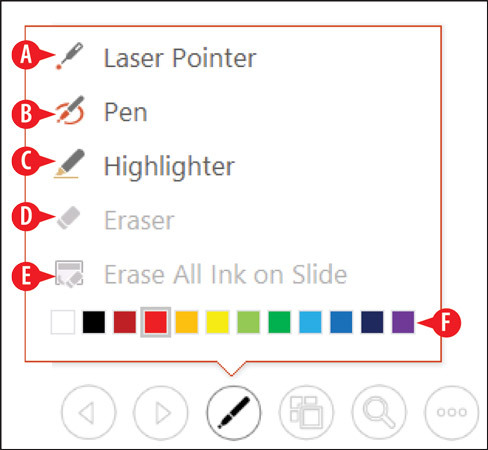 The Pen tools enable you to annotate slides. Show All Slides: This opens the Show All Slides pane. Zoom In to the Slide: Enables you to zoom in to show a close-up of part of a slide. Black or Unblack Slide Show: This temporarily hides the presentation, replacing it with an all-black screen. If you want a white screen rather than a black, click more slide show options, point to Screen, and then click White Screen. More Slide Show Options: This button opens a menu of additional options, such as Pause, Help, Screen, and Hide Presenter View. Make the Text Larger and Make the Text Smaller: These buttons control the font size of any speaker notes for the active slide. End Slide Show: This ends the slide show (both monitors). Display Settings: This opens a menu from which you can choose to swap which monitor is showing which image, or make the slide show appear on both monitors (effectively closing Presenter view). 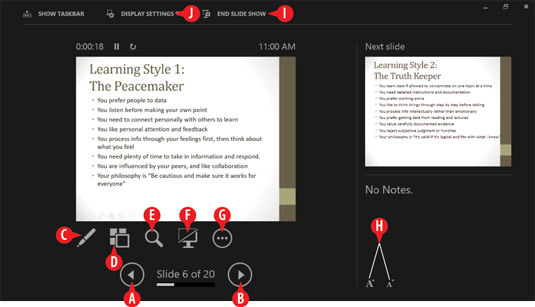 Presenter view provides tools for managing a running presentation.